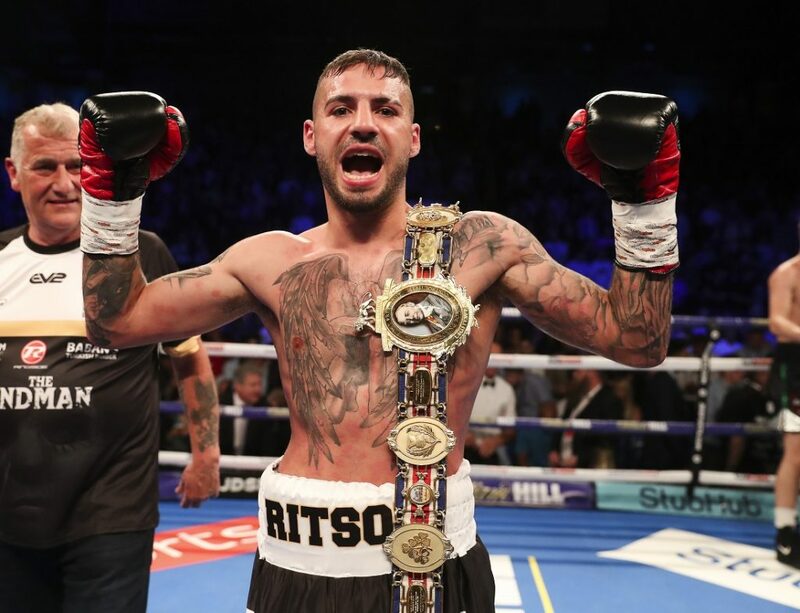 Lewis Ritson says he feels unstoppable after producing another stunning display of power to destroy Paul Hyland Jnr in one round to take home the British Lightweight title for keeps. Ritson blasted Hyland Jnr away inside the opening session of their clash in Newcastle, much to the delight of a raucous crowd in the Metro Radio Arena and presented his Dad and trainer Davie with the perfect Father’s Day present – a Lord Lonsdale belt for the mantelpiece. The ‘Sandman’ put the unbeaten Belfast man away in a similar fashion to the devastating defences against Joe Murray (first round) and Scotty Cardle (second round) and now the 24 year old is setting his sights on more belts when he returns to action. “I’ll fight anyone Eddie Hearn puts in front of me – I feel unstoppable right now,” said Ritson. “ I feel that I am probably done with domestic level but if Eddie wants to put me in with [Commonwealth champion] Tommy Coyle or go for the European, the team will make the right choice. “I think that atmosphere would take some topping. You need a bit of luck in this game and you have to keep winning, but if I do that, there’s no reason why we can’t get to St. James’ Park in a massive fight. “That belt belongs to my old man, he gets them all and I want to give him more and fill his trophy room up. Hearn was ‘blown away’ by the atmosphere on Saturday night, and while he wants Ritson to make improvements to his all-action style, he’s dreaming big for the future of the man he called ‘the most exciting fighter in Britain’. “I knew the numbers were good and I expected a good atmosphere but that blew me away,” said Hearn. “It’s so god to come to a city where the people are thankful to have big-time boxing there. In London, Manchester, Liverpool and so on, it’s a regular thing, but it’s not there. We don’t want to milk it but we will be back here and there’s some special, special talents in Lewis and Josh Kelly, and there’s other fighters too. “I was surprised by how cool Lewis was. We were standing behind the curtain backstage and he’d never seen anything like what was waiting for him on the ringwalk. When the music started and got in the ring, the noise and the energy was something else and I looked at him and thought, ‘I hope you are calm, because I’m not’. “But he was so calm. That’s the sign of a fighter with a very good temperament and that’s what I think he has. He’s still got a lot to learn, when he’s trading his chin is in the air and you cannot do that against fighters that can punch as you step up the levels. “What he does have is extraordinary power, he’s a better technical fighter than we’ve seen, and I want to see that come out and develop as a boxer rather than ‘je’s just a ticket-seller’. We will bring him back to Newcastle but I’d like him to box away from home and get rounds, so he can develop under less pressure than he’s under in Newcastle. “He’s arguably the most exciting boxer in Britain right now – everyone is talking about him and everyone wants to watch him – but I don’t want him to become a guy that people think just marches forward and knocks people out. He’s had 16 fights, and his last three fights have ended inside four rounds total.